A UV Heat Shield helps reduce interior temperature and protect the interior from damaging sun rays that penetrate the front windshield. Our heat shields are custom patterned, insulated and are custom patterned to follow the outline of the windshield. We have over 500 patterns to fit most popular cars, pickups and vans. Front windshield UV shields provide protection at the beach, work, airport, or anywhere you park, and they’re easy to use. 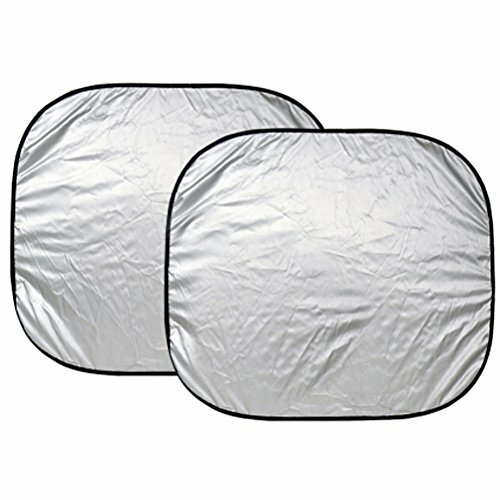 The UV heat shield has a silver reflective fabric on the outer side and a soft felt on the inside. Both fabrics are laminated to a foam core board which acts as an insulator and the silver outside-facing fabric helps reflect damaging UV rays. Available in 5 colors and is backed by a 90 day limited warranty. A UV Heat Shield helps to reduce interior temperature and protect the interior from damaging sun rays that penetrate the front windshield. This heat shield is custom patterned, insulated and follow the outline of the windshield. 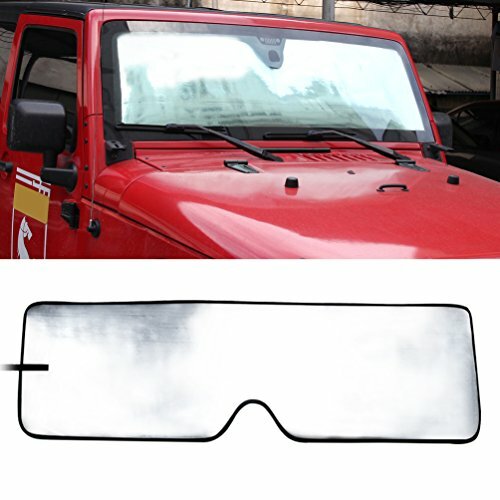 Front windshield UV shields provide protection at the beach, work, airport, or anywhere you park, and they are easy to use. The UV heat shield has a silver reflective fabric on the outer side and a soft felt on the inside.Both fabrics are laminated to a foam core board which acts as an insulator and the silver outside-facing fabric helps reflect damaging UV rays. Product Store When not in use, Lift sunvisors and pull it down. Roll up from end to end. Fitment: For 2007 2008 2009 2010 2011 2012 2013 2014 2015 2016 2017 Jeep Wrangler. A UV Heat Shield helps to reduce interior temperature and protect the interior from damaging sun rays that penetrate the front windshield. Covercraft's heat shields are custom patterned, insulated and follow the outline of the windshield. Covercraft have over 500 patterns to fit most popular cars, pickups and vans. 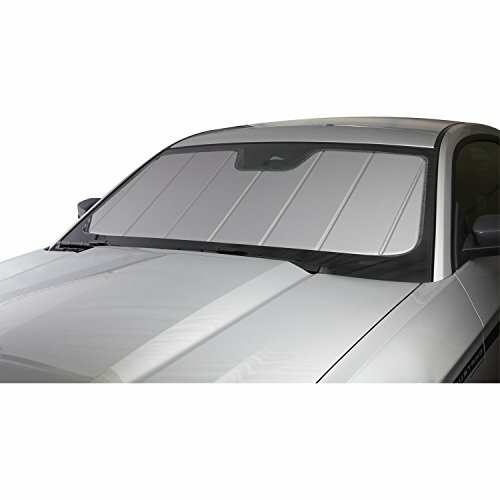 Front windshield UV shields provide protection at the beach, work, airport, or anywhere you park, and they are easy to use. The UV heat shield has a silver reflective fabric on the outer side and a soft felt on the inside. Both fabrics are laminated to a foam core board which acts as an insulator and the silver outside-facing fabric helps reflect damaging UV rays. Available in 5 colors and is backed by a 90 day limited warranty. Solar shield sun protection from custom accessories keeps your vehicles interior cool and protected under the harshest conditions. Block heat and damaging UV rays while your car is parked in the sun. Sizes to fit most cars, trucks and SUV's. 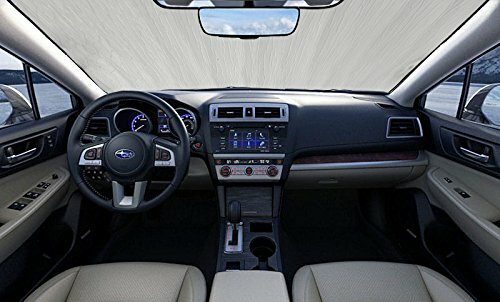 Looking for more Custom Sunshades similar ideas? Try to explore these searches: Bass Jig Heads, Front / Rear Chassis, and Kilim Jute. Shopwion.com is the smartest way for comparison shopping: compare prices from most trusted leading online stores for best Custom Sunshades, Uncle Bens Whole Grain, Four Seasons Kittens, Custom Sunshades . Don't miss this Custom Sunshades today, April 19, 2019 deals, updated daily.